January 15, 2013, 6:00 – 8:00 p.m. The I-80/SR 65 interchange is an integral connection and well-used by many people travelling along the I-80 and SR 65 corridors. Congestion created by those using the interchange causes traffic to back-up at points along these corridors. 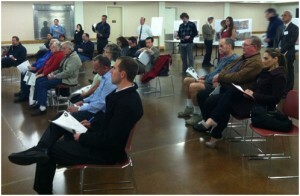 The Placer County Transportation Planning Agency (PCTPA), in collaboration with the California Department of Transportation (Caltrans), Federal Highway Administration (FHWA), the cities of Lincoln, Rocklin, Roseville, and the County of Placer, are looking for ways to improve the I-80/SR 65 interchange and adjacent transportation facilities. The objectives are to reduce congestion and improve traffic operations and safety in the project area, while maintaining access to local streets and businesses within the corridors. Improvements to the transportation facilities would comply with current Caltrans and local agency design standards and consider all travel modes and users. 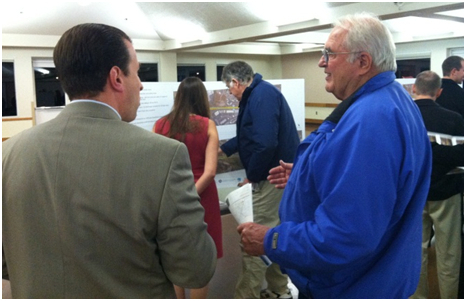 The project will be designed and built over several phases, depending on funding availability. This community workshop was the third in a series of public workshops and hearings being planned by PCTPA to involve the public and obtain input during the Project Approval and Environmental Document (PA&ED) phase. 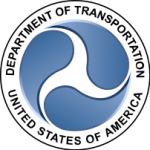 This project is subject to state and federal environmental review requirements because the use of federal funds from the Federal Highway Administration is proposed. Accordingly, project documentation will be prepared in compliance with both the California Environmental Quality Act (CEQA) and the National Environmental Policy Act (NEPA). As part of the process, a notice of preparation (NOP) was released on January 2, 2013. The NOP serves as a request for comments from the responsible and trustee agencies regarding environmental issues, reasonable alternatives, and reasonable mitigation measures that should be discussed in the draft EIR/EA to address each agency’s specific concerns in their areas of responsibility. This workshop served as the Public Scoping meeting, a requirement of the environmental process. The purpose of this workshop was to review the project’s progress to date, introduce the 5 alternatives, and gather input from community members. 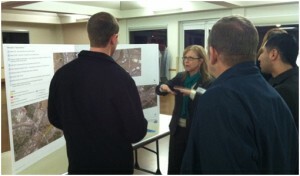 PCTPA is beginning the environmental assessment for this project and the public scoping meeting was an opportunity for the public to provide comments or concerns. Input received will become part of the public record and will be considered in developing alternatives to be studied in the environmental document. Community workshop notification flyers were sent via e-mail to local jurisdictions (Cities of Lincoln, Rocklin, Roseville, and Placer County); interested agencies; vicinity organizations/businesses, and interested individuals. The notice was posted to PCTPA’s web site (www.pctpa.net) and the project web site (www.8065interchange.org). 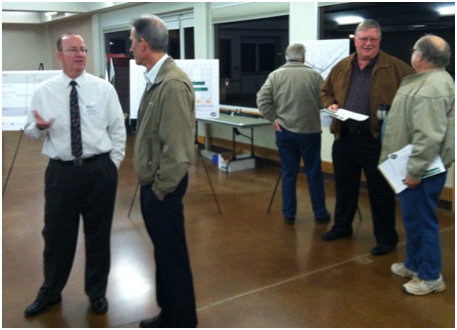 Meeting information was also posted on the following websites: City of Roseville, Roseville Coalition of Neighborhood Associations, Roseville Chamber of Commerce, City of Lincoln, and Lincoln Chamber of Commerce. A public meeting notice was placed in the “A” section of the Roseville Press Tribune and was published on December 14, 2012. Common benefits of Alternatives 1, 2, and 3 were summarized including added capacity, high speed connections, High Occupancy Vehicle (HOV or carpool lanes), and local circulation improvements. The presentation concluded with a series of next steps including: finalizing traffic operational analysis, preliminary engineering of alternatives, environmental technical studies, and the draft environmental document. Following the presentation, attendees were encouraged to visit the information stations where the project team was available to answer questions. Attendees were given an informational flyer describing each alternative as well as a feedback form to provide input on the alternatives. Feedback forms could be turned in at the workshop, returned via email, fax, or mail, or filled out online on the project website. 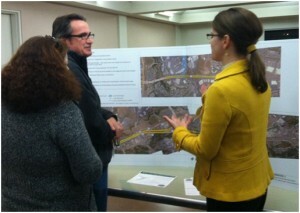 Community feedback will be summarized as part of the NOP comments received between January 2 and January 30, 2013.